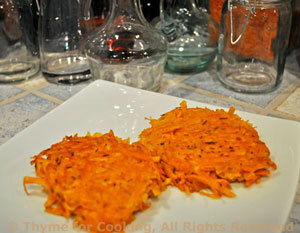 Fried Butternut Squash Patties, easy fall side dish, Thyme for Cooking. Shredded butternut squash, with a bit of egg to hold it together, fried until crisp. Shred squash using large holes on box shredder or food processor. In medium bowl lightly beat egg. Add mustard, bread crumbs, Parmesan, salt, pepper and mix well. Add squash and mix well. Heat large nonstick skillet over medium heat with 1 tbs oil. Divide squash into 4ths and spoon each 4th into pan, shaping into patty and patting down lightly. Sauté 10 minutes, or until brown, then turn and sauté the other side 10 minutes longer. Note: To clean butternut squash first peel it, using a potato/vegetable peeler. If it's large (typically) cut it in half between the 'neck' and 'bowl' ends. Then cut those in half the 'long' way. Scoop the seeds out of the round end and discard. I use the neck end for uniform pieces and the bowl end for soups and smaller pieces.